Reptilian species are largely under-represented in comparative genomics despite the fact that they are substantially more diverse than mammals. Given the high divergence of reptiles from classical model species, next-generation sequencing of their transcriptomes is an approach of choice for gene identification and annotation. In the EvoDevo journal, the group of Prof Michel Milinkovitch is reporting the sequencing and analysis of the transcriptome of four divergent reptilian species: the Nile crocodile, the corn snake, the bearded dragon, and the red-eared turtle. Their reptilian comparative transcriptomics dataset identifies 20,000 to 31,000 transcripts per species for a cumulated non-redundant sequence length of 250 millions nucleotides. They have also identified thousands of molecular markers and polymorphisms for future population and quantitative genetic analyses. Finally, Prof. Milinkovitch and his collaborators built very large alignments of protein sequences (about 2 millions amino-acids per species) and performed extensive phylogenetic analyses showing that turtles are not basal living reptiles but are rather the sister-group to Archosaurians (crocodiles & birds), hence, answering a long-standing question in the evolution of vertebrates. The “Reptilian Transcriptome v1.0” is freely available at www.reptilian-transcriptomes.org. 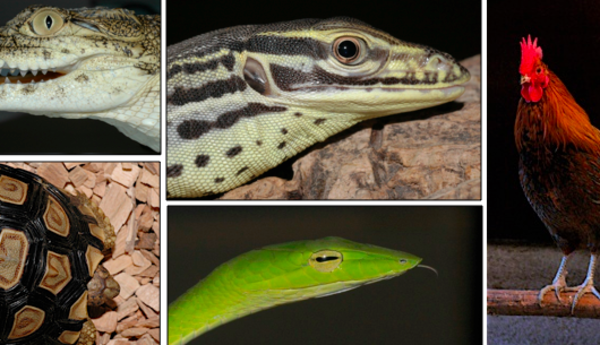 It should prove a useful new resource for many researchers as reptiles are becoming important new models for comparative genomics, ecology, and evolutionary developmental genetics.